Just 6 days after the Boilermaker, I logged my 1,000th mile of the year–a milestone that took me exactly a year to achieve in 2012 took me less than 8 months this time around. I was already on the second of 3 pairs of New Balance 860s, my shoes of choice, and felt stronger, faster and more confident than at any time since I started running. For the next 10 weeks, I was back into the work/run/eat/sleep repeat routine. Fortunately, the temperatures and humidity over the rest of the summer were not as tough as those during the summer of 2012, and I was able to pick up the Hanson’s program seamlessly and stay with it conscientiously, achieving all the weekly mileages plus or minus a couple of miles. The name of the game became consistency. Tempo runs were all achieved at paces of 9-minute/miles or below, and the the dreaded interval workouts all yielded fast times as well. The only matter for concern were the 16-mile long runs, which to me felt just a little too slow. Each one of them came in around 2-1/2 hours, well in the 2 – 3 hour envelope suggested in the Hanson’s method, but at 9-1/2 minute/miles, they were still much slower than the targeted 9 minute/miles I would need to run my goal for Rochester: an ambitious sub-4-hour marathon. Family commitments prevented me from running the Turning Stone 1/2 Marathon which, at 4 weeks out from the Rochester Marathon, was perfectly positioned to be my tune-up race for the main event. 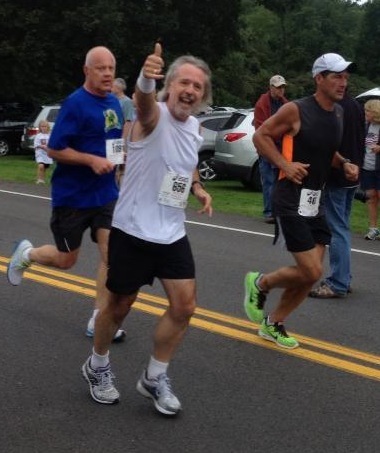 Instead, I ended up running the ARC of Onondaga 1/2 Marathon early in September. I was hesitant to do so as the marathon was so close and the program was tapering. However, that weekend I was due to run 20 miles anyway, so I felt it was worth the risk. This time, my instincts were spot on. Spurred on by Team Love Nugget (which, on this day, comprised my daughter Hannah, her friend Ellie and my partner Tessa), I ran a fast and strong race which surprised us all. Targeting a sub-2-hour race, I knew had the good stuff in me right from the word go.The first mile of the race was a loop that bought us back to the start line–where Team Love Nugget were in fine vocal form–before we headed out for a couple of miles on the paved West Trail of Onondaga Lake Park. I was conscious that my pace was fast, but I figured I would keep it that way for as long as possible to see what I had in me. It’s easy to look happy when you’re just a mile in! Arc of Onondaga 1/2 Marathon, September 7, 2013. Around 3-1/2 miles in, the course came off the trails of Onondaga Lake Park and onto the roads of Lakeland, and for the next 3 miles I kept up a comfortable 8:30 pace before facing an uphill stretch along Van Buren Road. While the elevation wasn’t overly challenging (100 ft. in 1-1/2 miles, which, if my math is correct, is about a 1.3% gradient), it was enough to sap some energy and reduce my pace. But if running the Boilermaker all these years has taught me one thing, it’s that what comes up must come down. The turn onto Walters Road heralded an equally long downhill stretch, and the simple act of opening up my stride resulted in a blistering 7:48 split between miles 8 and 9 and the perfect setup for the end of the race. By just keeping up the 8:30 pace I had established at the race’s beginning for the last few miles back along the Long Branch trails, I was in position to PR in a big way. With the finish line in view, I passed another runner by taking the inside track on a right-hand turn, and I was reminded of my first 1/2-marathon just two years earlier when I picked off runners heading down the Onondaga Lake Parkway, just a few miles from where I was now. My eventual time was 1:53:11–my first sub-2-hour 1/2, and a full 17:27 faster than that first 1/2–and while the post-race celebration with Team Love Nugget were thoroughly enjoyable, my thoughts were already on Rochester, which was now just two weeks away. This entry was posted in The Flat-Footed Fox and tagged Boilermaker, fitness, Hanson's Marathon Training, long-distance running, Rochester Marathon. Bookmark the permalink.